McDowell said: “Rory and I are taking it very seriously and we would certainly love this to be on our resume. He’s in great form and the world No 2. I guess you could say I’ve got myself a decent partner this week. “You have to be able to motivate and inspire each other and enjoy the experience of being in contention and under pressure, and hopefully enjoy the experience of winning together. McIlroy and McDowell have won majors as individuals and the Ryder Cup and the Seve Trophy as team players. But they would love to follow in the footsteps of 1958 winners Harry Bradshaw and Christy O’Connor and 1997 champions Padraig Harrington and Paul McGinley. They are also keen to avenge their one shot defeat to Italy two years ago, when they finished tied for second on the Shenzen course at Mission Hills. The event is traditionally held every year but has now been switched to every two years to try and boost the field. That’s worked this year with Ian Poulter and Justin Rose representing England and major winners Louis Oosthuizen and Charl Schwartzel flying the flag for South Africa on the Blackstone Course, where precision ironplay will be key. McDowell said: “I said two years ago I felt the World Cup was lacking respect but this year’s field seems a lot stronger than it has in years gone by. It is great to see teams supporting it. When you look at the flags at the back of the practice range and you see guys like Arnold Palmer and Jack Nicklaus have won it, it kind of puts in perspective what kind of event this is. “It’s tough; there’s a lot of golf to play around the world these days. With The Presidents Cup last week, it’s understandable that a lot of the other international players maybe haven’t had a chance to come here. It remains to be seen if the event will continue with tour insiders insisting that it’s likely to be scrapped due to lack of suitable dates for the world’s best. The Americans have had to call on world No 10 Matt Kuchar and big hitter Gary Woodland due to a clash with the Thanksgiving holiday in the US. Australia is also weakened with Brendan Jones and Richard Green the strongest duo they could find as top three Adam Scott, Jason Day and Geoff Ogilvy all play in the clashing Australian PGA. McIlroy just wants to team up with pal G-Mac again and get another win together. Rory said: “Every time I play golf with Graeme is a lot of fun for me. It’s a partnership that’s worked well in the past and I think we have a very good chemistry on and off the golf course. “We came very close a couple of years ago. It would be great to get ourselves into the position again with a chance to win. “We have won a few times as individuals on the golf course, but to win as part of a team is very, very special and it’s not something that we really get to experience that much. McIlroy’s former stablemate Darren Clarke is in Australia hoping for an accident-free visit to the Australian PGA. Two years ago the Open champ narrowly avoided serious injury when his buggy plunged into a bunker at Royal Sydney in the Australian Open. 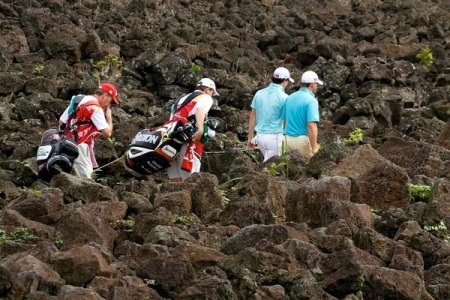 Clarke escaped with leg bruising and partner Robert Allenby dived out of the cart in mid-air during a rain delay evacuation. Clarke beamed: “The guy driving back didn’t know the course. He had a very fast cart and we found ourselves going straight into a bunker. This time he’s in Brisbane hoping he can emerge from his post-Open slump and avoid doing more damage to the Claret Jug. As Clarke tees it up with hero Greg Norman and Adam Scott, fellow Ulsterman Gareth Maybin will be trying to save his European Tour card in the South African Open. The Ballyclare ace is three spots outside the crucial top-115 who keep their cards following next week’s UBS Hong Kong Open. Damien McGrane, who is 112th in the Race to Dubai standings, will be hoping that his €9,746 cushion over 115th man Carolos del Moral will be enough when he returns to action in Fanling. In Thursday's fourball 58 they didn't have a five on their card. But Rory McIlroy and Graeme McDowell showed they are somewhat human after all when they carded a six and a seven in a battling foursomes 68 and still remained three clear in the Omega Mission Hills World Cup. The Ulstermen cruised five shots clear of the field after two birdies and an eagle on the front nine but stuttered on the way home before recovering brilliantly.